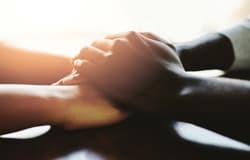 Cancer patients' caregivers are often "hard to get through to," says Annie Trance, MSW, LISW-S, program manager, Psychosocial Oncology, at The Ohio State University Comprehensive Cancer Center — James (OSUCCC — James) Cancer Hospital and Solove Research Institute. By this, Trance means that in many cases the spouse, parent, child or friend who takes care of a loved one battling cancer often devotes all of his or her time and energy to that person. "These caregivers are juggling not only dealing with the cancer, but they may also have to work and may have other family members to take care of, perhaps young children, and they also have to arrange for meals and for medical appointments," Trance says. "They don't prioritize any time for themselves, and when they do they feel guilty." If Trance could sum up her message to caregivers—the unsung heroes of so many cancer journeys—in one sentence, it would be: "Caregivers also need to take care of themselves." This is easier said than done, and that's why Trance and the Psychosocial Oncology team work with cancer patients and their caregivers to recognize and deal with all the stresses and anxieties they face. It's also why JamesCare for Life offers several programs designed to help caregivers take better care of their loved ones and themselves. The OSUCCC — James' Psychosocial Oncology team counsels many cancer patients, and in some cases their caregivers are part of the counseling process. Get plenty of rest, eat healthy meals and exercise. Ask for help from family, friends or clergy. Let those who offer to help know what they can do, such as cooking meals, doing housework, running errands or providing childcare. Plan an hour a day or an afternoon each week away from caregiving. Talk with others about your feelings. Join a support group. Talk to a counselor or therapist. Practice meditation and other relaxation techniques, such as prayer, yoga and tai chi. Take a walk or do other exercise, work in the garden, take a bubble bath, listen to music, read or watch TV to rest your mind and help you relax. Treat yourself to a gift of a magazine, flowers or dinner out. Talk to your doctor about your life change and keep your own doctors appointments. Visit cancer.osu.edu to learn more about how caregivers can remember to care for themselves.